In an era where a player will easily bolt a team who drafted him for another who offers a bigger pay day, NFL players get a rap for being greedy. Money hungry. Disloyal. But loyalty is a two way street. The way I see it, NFL teams are just as disloyal–if not more–than the players themselves. The adage amongst NFL players is true–get the money while you can. Because when you begin to break down, an NFL team will cut you loose. And it doesn’t mattter how many years you put in. How many consecutive games you played. How great you are with the fans and in the community. At the end of the day, this is all a business. And teams will do what’s necessary to keep their business afloat. Look no further than LaDainian Tomlinson. An incredible running back who was instrumental in helping to lift the San Diego Chargers out of the muck of mediocrity, is now being strongly considered as trade bait. This is the same Tomlinson who, just a few years ago, was consistently re-writing the record books. This is the same LT who has been nothing but the consummate professional–a player teams wish they could consistently draft year in and year out. If you’re Tomlinson, that cannot feel good to hear. And while injuries may have slowed his production, these were injuries he received while gutting it out on the gridiron for the Chargers. Again, a team must do what’s in their best interest–not the player. But loyalty goes both ways. The next time a draft pick holds out of training camp or a marquee player threatens to sit out the season, as a fan, don’t get upset. They are doing what’s in THEIR best interest. Because in the NFL, it doesn’t matter who you are, or what legacy you have created. In the end, the hammer will fall on you, and it won’t be pretty. Time to Change the Overtime Rule? In the wake of the Colts/Chargers game–a game that went into overtime and was won by the Chargers’ Darren Sproles scampering into the endzone–many critics are suggesting that the rule (which states that the first team to score wins) should be changed. While everyone would certainly have loved to see what the Colts could’ve done had they won the coin toss, the rule is fair. Simply because a team wins the coin toss does not mean that the opposing defense will roll over and die. If the opposing team wants to win, have the defense step up and make a play. Remember, the Eagles and Bengals played all the way to the end of overtime without anyone scoring a point this season. While the college rule is exciting, it’s almost too fair. The ball is placed on the 25 yard line with a first and ten without the help of special teams. The offense is almost guaranteed to score at least a fieldgoal. If anything, it gives the offense too much of an advantage. The mantra in this country is that soceity is going too soft. Kids complain that they lost in a Championship game and feel sad, so parents petition the school to hand out “runner up” trophies. Hell, they have even banned dodge ball and tag in some schools. And we wonder why there’s a child obesity problem? Yet at the same token, we want our kids at the college level to have an “equal chance to score?” We need to realize that the concept of overtime is implemented because both teams couldn’t seal the deal in four straight quarters. Overtime should indeed be a “sudden death” approach–if you couldn’t win the game over the course of regulation, you have one last, limited chance to do so in overtime. Regardless of whether or not it’s fair. If the overtime rule was indeed altered, I wouldn’t mind seeing the NFL ban field goals. While it’s perfectly acceptable to kick a field goal to win a game, I think if you eliminated the ability for a team to make this attempt, it would allow both the offenses and defenses to truly go toe to toe. And more than likely, I would imagine that the team that wins the coin toss won’t immediately score on their first drive, thus allowing more of an opportunity for both opposing teams offenses to get a chance on the field. It would also allow for a bit more of an exciting finish, without feeling as though the ball needs to be placed on an arbitrary yardline without the use of a kickoff. Why Are the Colts Perrenial Playoff Losers? The Colts are king of the regular season. They consistently win 10+ games every year. Their coach has an even keeled demeanor and their team has some of the best collection of talent in the league. With Saturday night’s loss to the 8-8 San Diego Chargers, however, it must be asked…why do the Colts lose so much in the playoffs? As the record shows, over the past decade, the Colts have made the playoffs nine times. In nine trips to the post season, they have won the Superbowl once, and went to the AFC Championship only twice. They have lost in the wildcard round three times, while falling in the divisional round four times. And in their AFC Championship win against the Patriots in early 2007, it must be noted that the Colts were down by 18 points. 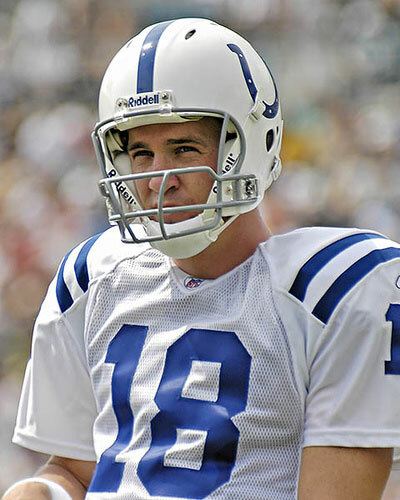 One could argue that Manning and the Colts won that game just as much as the Patriots lost it. So why is this the case? No one really knows. Some may want to blame Dungy, a laid back coach who often chooses (like last season) to rest his starters before the playoffs begin. Compare that to what Giants coach Tom Coughlin did against the Patriots in week 17–where New York played as if the last game of the season was the Superbowl instead of a meaningless game for the Giants. Does that have a genuine effect? No one knows for certain. Some want to blame Peyton Manning or the finesse offensive scheme. Is Manning a poor playoff quarterback? Are the Colts too much of a soft team during the regular season to compete with the tougher, more aggressive teams in the post season? We’ll probably never know for certain. But be sure to share your thoughts on why the Colts have so many problems in the playoffs. This NFL Wild Card weekend will have dirty birds, rookie QBs, MVPs, All-Days, Burners, Bolts and Colts. It also features all 4 home teams as underdogs — first time I’ve ever seen that. Let’s get to the picks. Short and sweet. It’ll be a shootout in the desert. The Falcons will score points because the Cardinals are 0-6 against teams who were in the top 10 in rushing (the Falcons are ranked #2 behind the Giants). Then, after a steady diet of Mike Turner and Jerious Norwood, Matt Ryan will open up the field against Arizona’s 22nd ranked pass D. On the other side, Arizona will take to the air because they are dead last in rushing, and so we’ll see the Kurt Warner show against Atlanta’s very shaky secondary. This game may also get messy with the presence of John Abraham and his 16.5 sacks. Though a lot of things point to an Atlanta win, you cannot count out Captain Kurt at home. He will go down chucking the ball to his talented trio of receivers, and if he misses, well that’s just better field position for the dirty birds. One big stat: the over is 9-1 in Arizona’s last 10 home games. Will Peyton take it lying down? The Chargers may be on a roll with 4 wins in a row to close the season, but if you look closely they were against the doormat Chiefs, lowly Raiders, and self-destructing Broncos and Bucs teams. The Colts are riding a 9-win wave themselves with quality victories over the Steelers, Patriots and a 23-20 Week 12 win over the Chargers at Qualcomm. In this matchup of two premier QBs, I’ll take Indy’s 6th ranked pass D over the 31st ranked San Diego pass D (only the Seahawks were worse). It will be close throughout, but look for the Colts to slow this game down, and finish with a vintage Peyton Manning, long, drawn-out, antsy, multi-audible, drive. Will Ed Reed touch the ball more than Ricky Williams? Baltimore’s D will be too much for Pennington and Miami. In their 27-13 Week 7 win over the Dolphins, the Ravens stopped the vaunted Wildcat offense allowing only 71 rush yards and forcing a pick 6 courtesy of Terrell Suggs. Look for Baltimore to bring the same defensive gameplan and challenge Pennington to go deep (not his strength) where my pick for Defensive Player of the Year, Mr. Ed Reed (and his 9 INTs), will be waiting. All rookie QB Joe Flacco has to do is his best Kerry Collins imitation and take care of the ball and make simple, low risk plays, and leave the rest to Ray Lewis, Bart Scott, Suggs and company. The Dolphins’ and Pennington’s comeback story has been inspiring this year, but it ends this weekend. If the Eagles were facing any other NFC playoff team, I might think twice about picking them because of their inconsistency and much too frequent brain farts. But against the one-dimensional Vikes, it makes it easy for D-guru Jim Johnson to scheme up ways to stop Adrian Peterson and expose the Vikings passing game. Yes, Minnesota has the top-ranked rush defense, but Philadelphia isn’t too shabby at #5. The difference is that Philly has a very efficient McNabb, who’s making the right reads of late. Also, the Eagles 3rd ranked pass defense will feast on Minny’s 25th ranked pass offense. Nothing else here other than the Eagles secondary has been swarming, and if any bit of the intensity brought against Dallas shows up, it’ll be a long day for Tavaris Jackson. Hopefully, we don’t get any of this on the sidelines. As 2008 draws to a close and 2009 brings us the beginning of the playoff season, we should look back on what makes us love football so much. The great thing about the NFL season is that, no matter what you think you know, you really know nothing. When the NFL schedule was released in spring 2007, everyone thought the Cowboys would be Superbowl champs. Everyone thought the Dolphins and Falcons would be battling for the number one pick. Many thought that Tom Brady would help lead the Patriots deep into the playoffs and that the Eagles were getting ready to say goodbye to the Donnovan McNabb era. Early in the season, many thought that the Redskins were a great team and that Jason Campbell was emerging as an elite quarterback. Many thought that the Buffalo Bills had finally become contenders in the AFC East. Who would’ve thought that the hard-nosed Tampa Bay Buccaneers would lose all of their games in December, including a match-up against the lowly Raiders, thus ending their playoff hopes? Who would’ve thought that in the same game–in the fourth quarter no less–that running back Carnell Williams would tear up his knee yet again after a year long rehab? Who would’ve thought that we would’ve seen a team like the Patriots come so close to immortality in February and just ten months later, see the Detroit Lions get inducted into the Hall of Shame? Who could have forseen that this time a year ago, Michael Vick began his prison sentence. Just one year later, his Falcons have a franchise quarterback, a coach of the year candidate, and a playoff birth? Who would’ve thought that Drew Brees could throw for over 5,000 yards (coming 16 yards shy of the passing record) and 34 touchdowns and not even be in serious contention for the MVP award? Who would’ve thought than the Patriots could go 11-5 and miss the playoffs, while the 8-8 Chargers host the 12-4 Colts and the 9-7 Cardinals host the 11-5 Falcons this weekend? This has been a season of surprises and jaw dropping moments. As Don Cheadle (below) once said, the “crazy” is why we love it. I don’t understand how the Broncos can have the AFC West in the palm of their hands for weeks, only to crash and burn down the stretch. I don’t understand how the mediocre Broncos now have to play the mediocre Chargers for the right to be called the AFC division champions. I don’t understand how an 8-8 team (Broncos, Chargers, Cardinals) can conceivably win their division. I don’t understand how Joe Flacco and Matt Ryan can play lights out as rookies, but Derek Anderson looked lost all season. I don’t understand how the Pittsburgh Steelers won their game against Baltimore with a suspect catch, but a similar ending involving the Eagles on Sunday resulted in a completely different call. I don’t understand how a reporter can get away with asking Lions head coach Rod Marinelli if he wished his daughter married a better defensive coordinator. I don’t understand how the Patriots can actually finish the season with an 11-5 record, but still miss the playoffs. I don’t understand why the Cowboys get so much of the spotlight for such an inconsistent, overrated squad. I don’t understand how the Cardinals even deserve to watch the playoffs, let alone play in them, after their disgraceful performance in New England. I don’t understand how Matt Cassell went from the verge of being cut in the pre-season to playing such inspired football. I don’t understand how the Saints have squandered such an incredible season by Drew Brees. I don’t understand how the Jets could blow such a big opportunity for the playoffs by losing to the lowly Seahawks. I don’t understand how both Jerry Porter and Donte Stallworth can feel good about collecting their paycheck every week. I don’t understand how the NFL refuses to compensate the old timers who built this league into what it is, but they’ll fine Wes Welker for making a snow angel. I don’t understand how Tony Siragusa is at all necessary on Fox Broadcasts. I don’t understand why Ed Hochuli is just now considered to be “off the hook” for his blown call in week two when the Chargers have been a sub-par team all season long. What are your thoughts on the biggest surprises of the NFL season?